Yesterday, we took a brief look at the Cubs' 2nd Round selection from the June Draft: Dan Vogelbach. He's still just an unsigned amateur, and may end up accepting a scholarship from the University of Florida if the Cubs do not meet his asking price, which could be in the neighborhood of a $1,000,000 signing bonus. The Cubs did consider taking him with the ninth pick in the first round, they said. 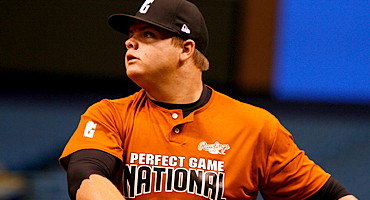 Vogelbach said, "The Red Sox and Rays were interested as well." Before pick No. 68, teams asked the Vogelbachs if they'd lower their signing bonus figure. The family said no. 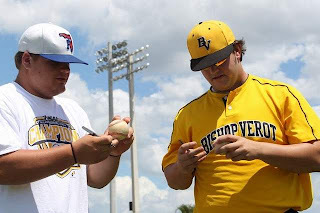 "We made a decision of what it would be worth not to go to college," said father Dan Vogelbach, whose son received a scholarship to attend the University of Florida. "We were not going to deviate, so we agreed not to go lower." Before the draft, the Vogelbachs wrote down the bonus amount they wanted, sent it to the Major League Scouting Bureau and asked that it be given to every team. Dan Vogelbach said what they asked for is a little higher than what past picks at No. 68 averaged. Those ranged from $477,000 to $1.1 million the past five years. 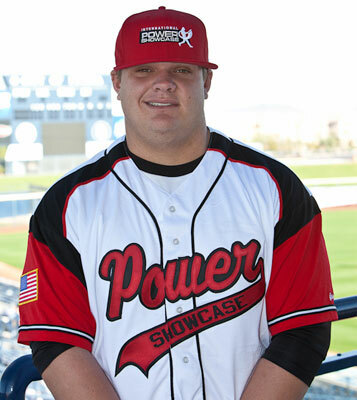 "Four teams said it was an extremely fair number," Dan Vogelbach said. Daniel Vogelbach is a 2011 1B/OF with a 5-11 280 lb. frame from N. Ft. Myers, FL who attends Bishop Verot HS. Extremely strong build, has lost weight and looks great. Short simple swing mechanics, outstanding bat speed, ball jumps hard on contact, different sound than other hitters this age, easy plus power to all fields, hit one 400' feet to LCF in batting practice, very confident in his ability to hit. Vogelbach is enormously strong, and along with his loose, easy wrists generates outstanding bat speed from the left side of the plate. Another factor that makes Vogelbach unique in the scouting community is that it is almost easier to break down his mental approach to hitting, rather than his physical approach, especially after granting him his raw strength and bat speed. The young man eats, sleeps and breathes swinging a bat, and is an exceptionally-confident hitter who doesn’t believe that any pitcher should ever get him out. It sounds like he will likely sign with the Cubs. 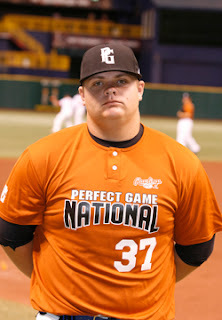 This kid weighed over 280 lbs a couple of years ago, worked very hard to lose weight, raising his draft stock, and is likely looking to cash in. If you subject his body to three years of college (the minimum before he's eligible for another draft), he could very well gain a Freshman Fifteen each year. 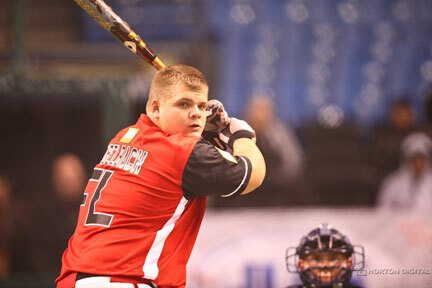 Would he go in the top 68 picks in 2014, if he weighs 280-290 lbs? That is literally a huge risk. Of course, it's a risk the Cubs would be taking by using their 2nd Round pick on him and potentially investing close to a million dollars that his body continues to improve, rather than the alternative. All told, I hope he does sign with the Northsiders. Perhaps, he'll be part of something special for the Northsiders in about 5 or 6 years, but I'd settle for him being part of a special trade in about 3 seasons. Uh, that's him on the left.